Wood Lane station was the western terminus of the Central Line between 1908 and 1920, built to serve the Franco-British Exhibition. The station originally only consisted of a single looped track, which allowed trains to return eastwards into central London without having to reverse. Two more platforms were added when the line was extended westwards but the working conditions were not ideal and the station was replaced in 1947 by White City station, slightly further up the line. All of the surface platform remains shown in these photos have been demolished to make way for the Westfield shopping centre; click here for a web site with some of the details. 5) Shepherds Bush station on the Central line, its original western terminus. 8) The westbound tunnel which has the tightest curve on the underground (the Caxton Curve, seen here running under Caxton Road). 2) The above ground original platforms of Wood Lane station. Platforms 1 & 2 were either side of the solitary track and trains travelled in an anti-clockwise direction, running around the loop back toward Shepherds Bush. 3) The route of the 1920 extension westward; the new westbound platform was in the vicinity of the arrow. There was not enough room to rectify the reversed running of the trains before reaching the new White City station, hence the right/left running at that station. Travellers on this line will be aware of the crossover point where the lines revert to normal running west of White City. 1) The western extension returning in an eastbound direction. 10) The old White City (formally named Wood Lane) station on what is now the Hammersmith & City line. It is being reopened (with its former name) on the other (eastern) side of Wood Lane to provide access to the north-western end of Westfield shopping centre. 9) The existing Shepherds Bush station on the Hammersmith & City line, renamed Shepherds Bush Market to avoid confusion with the Central line/West London line station. 7) The existing Goldhawk Road station on the Hammersmith & City line. 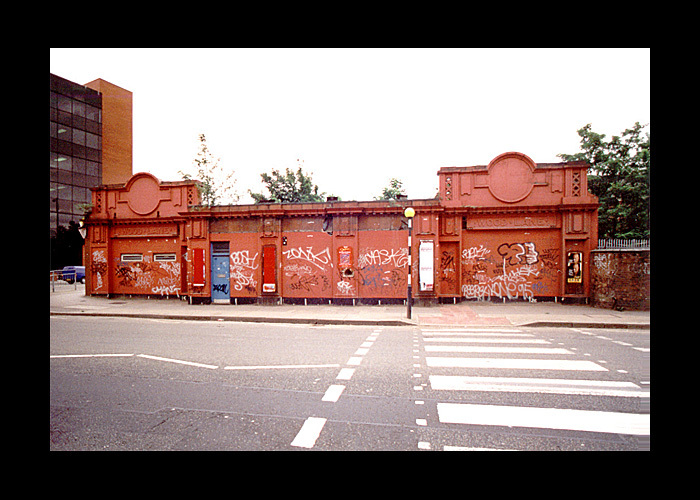 These two stations replaced the previous Shepherds Bush station situated between the two. 4) Uxbridge Road station on the West London line from Clapham Junction to Willesden Junction. This station has been rebuilt and reopened with the name of Shepherd's Bush on what is now known as the West London Line. It is more or less opposite the Central Line's station of the same name, though there is no direct link between the two. 6) The fifth disused station within the area of the map above is another Shepherds Bush station, this one on the LSWR line from Kensington Olympia to Hammersmith Grove Road. Part of the station building with the Wood Lane name still visible. The station building as it was in June 2000 and, moving your cursor over the image, the same area in August 2009 after the opening of the Westfield shopping centre. 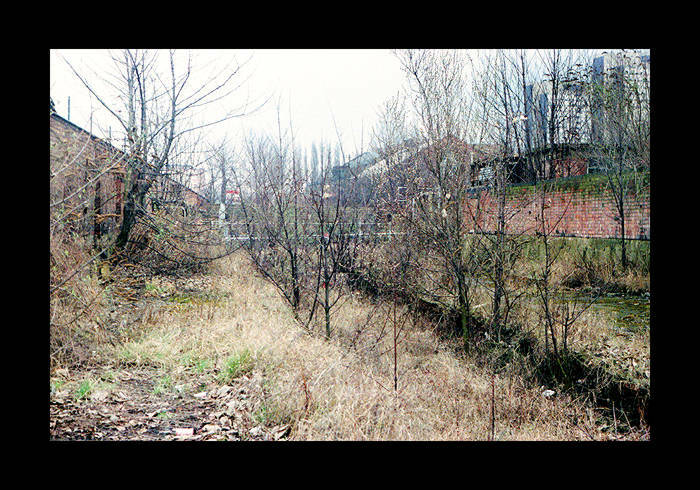 The second photo was taken from virtually the same position - the road widening is apparent. The black monolithic structure on the right, is a ventilation shaft for the eastbound track. Access to the depot is at the far end of the Westfield site. Now demolished, it has been replaced by a sub-surface one, which can be seen from the left hand side of an eastbound train shortly after leaving White City station. Part of author Nicholas Royle's powerful and riveting noir novel 'Director's Cut' is set in the Wood Lane station/depot area. Click here for his website. View from a westbound train. The course of the original loop can be seen here to the left of the railings (the raised bit). The lower bit (to the right of the railings) was the path that the westbound extension used to take - it used to pass the old Wood Lane westbound platform but was given a straighter avoiding route, after White City station was opened. The Wood Lane westbound platform was then adapted to provide access to the depot. View of a westbound train; the middle carriage of which is the approximate location from where the above photo was taken. This area has now been completely covered over by one of the Westfield shopping centre bus access roads. Following the original single track loop round, with platforms 1 & 2 on either side of it. 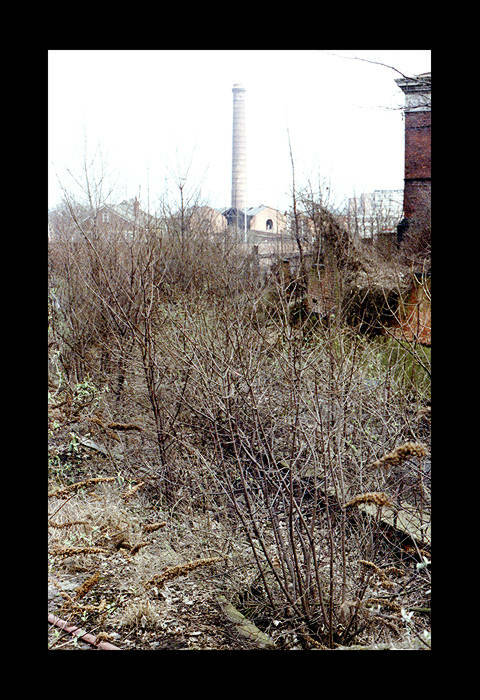 This photo was taken looking eastward, against the direction that the trains used to take i.e. back toward the area shown in the photo above. The blue railings seen in this photo aren't the ones in the photos above; the route was severed by the access route to the depot built post-closure (more details on that subject on the next page). This photo presents an old station in a bit of a sorry condition. For an even more sorry photo, move your cursor over the image to see the area as it was in August 2009. Facing the other way (westward) from more or less the same position but from the other platform. Looking eastward. The track area is just about visible through the undergrowth. Move your cursor over the image to see the same view in August 2009. Facing westward. 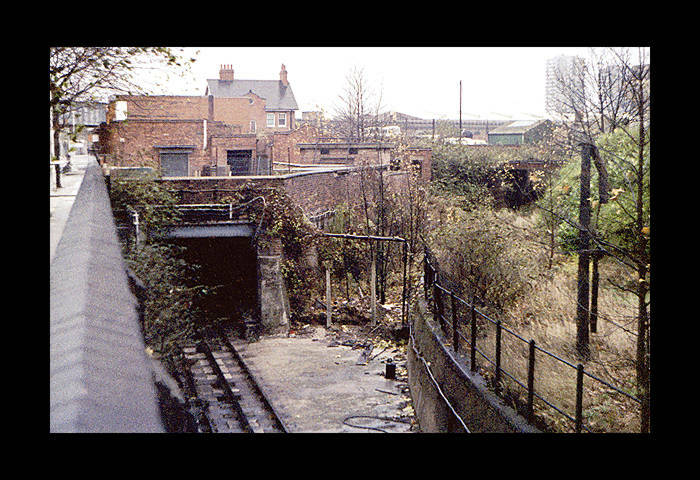 The remains of the walkway over the track to the platform 2 and the exit is just about visible. Footbridge that connected platform 1 with the station building. Aerial view showing the staircase in the photos above. The trains would run in a right to left direction. The viaduct in the background carries the Hammersmith & City line, and is where the H&C's own Wood Lane (later renamed White City) station was situated (it was closed in 1959). A multi-storey car park has since been built in front of the viaduct. Other side of the footbridge, looking back toward the direction that the trains came from. The end of the loop can be seen in the centre of the photo - this is the point where the eastbound extension joined it, on its way back to Shepherd's Bush (the camera is facing the direction from which the trains came). The footbridge in the photo above can be just seen as the line curves away at the right of the photo. The station building is on the left. The bridge in the distance on the left carries the Hammersmith & City Line. For a view of the area taken in August 2009 from more or less the same position, move your cursor over the photo. The eastbound track is still there, it's just buried. The sub-surface part of Wood Lane is dealt with on the next page.